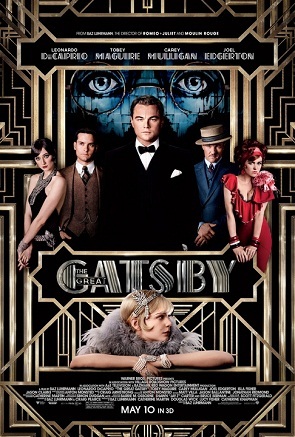 "The Great Gatsby" no doubt will allure you with a visual montage like no other. Its grandiose set pieces and mirage like transitions woo you back into the roaring excess of the booming Twenties. But in the process of making "The Great Gatsby" into a film that tickles the eyes, the process also leaves behind the life and heart of its tragic story. The long and elaborate conversations and scenes may seem to push the story further but in the end they don't. What is hidden is a beautiful and sad story about love and mostly hope but muddled by a noted excess for flair. Nick Carraway (Tobey Maguire) is a depressed alcoholic who is visiting his psychiatrist. He talks about a man named Gatsby (Leonardo DiCaprio) - the most hopeful man he had ever met. As Nick reminisces his time with Gatsby, we go back in the summer of 1922 as Nick moves from the U.S. Midwest to New York where he takes a job as a bond salesman. He rents a small house on Long Island next door to the lavish mansion of Jay Gatsby a mysterious millionaire who holds extravagant parties every weekend and across the bay from his cousin, Daisy (Carey Mulligan) and her philandering, blue-blooded husband, Tom Buchanan (Joel Edgerton). One night, Nick receives an invitation from Gatsby to one of his parties. It is thus that Nick is drawn into the captivating world of the super rich, their illusions, loves and deceits. As Nick bears witness, he pens a tale of impossible love, incorruptible dreams and high-octane tragedy. "The Great Gatsby" has all the elements to make a stupendous film. Visually, it is unparalleled. The set pieces alone are astonishing but Baz Luhrmann brings more to the table than even we expected. The film fairly uses 3D well enough to justify the premium price and the transitions from scene to scene are something to behold visually and creatively. And the visual flair transports you back into the life of the roaring Twenties. The acting was as impressive as the visuals. Most notably, Leonardo DiCaprio brings the mysterious Jay Gatsby into life. Leonardo is extremely magnificent as he switches effortlessly from the rich and eccentric mask that Gatsby shows to other people and his love-struck and hopeful nature within. Sadly, all the visual flair muddles the plot, the message and ultimately the effectiveness of "The Great Gatsby". Long and elaborate conversations and scenes seem to take too much time to develop. The film felt like it was concentrating in a lot of less essential stuff that made it feel tedious at times. Maybe in a few years, this version of "The Great Gatsby" will be much revered (we could definitely see that happening) but for now, it's great but not one that will leave a mark in our books.